SENATOR ELIZABETH WARREN: Oh, I'm glad to be here. JIM CRAMER: Okay. I want to start with-- we had Tim Sloan on last week, the CEO of Wells Fargo. And he talked about he feels, and I quote, that he's: ‘…The right person to run this company. And I believe that, 1) because I care deeply about the company. I’ve been there for 31 years. I know how the company operates. I've taken responsibility. I don't think you should be criticized for taking responsibility, acknowledging the mistakes.’ Why is that a bad stance? SENATOR ELIZABETH WARREN: Well, wait just a minute. Explain to me exactly how it is that he's taken responsibility? Let's just do a quick rundown, let me see if I can remember all the ways. He was part of that management team that enacted the policies that caused millions of customers to get cheated on fake accounts. Let's see. And then there was the scandal over adding car insurance and pet insurance and all kinds of charges to customers' accounts, putting people into default. Oh, and then there was the fact that Wells Fargo targeted communities of color for the worst mortgages, costing we don't know how many people their homes. Let's see. And-- what else was-- oh, I remember. And then there's this latest piece that comes out that Wells Fargo markets itself to colleges and universities to use their credit card as an exclusive offering to students. And Wells Fargo charges about three times as much as every other bank that's doing the same sort of thing. In other words, Wells Fargo has had a longstanding policy of scamming, squeezing, and cheating its customers. Tim Sloan has been right at the heart of that. And he wants to keep right on running Wells Fargo. Look, the central problem at Wells Fargo is they need a change in culture. I'm not the only one who's said that; their own regulators have said it, people on the street have said it. You don't get a change in culture by having the same guy who had his finger in every single scandal still running the place. JIM CRAMER: But Senator, the Sherman & Sterling Outside Directors Report -- 110 pages, it’s pretty thorough -- did indicate that he was not implicated and did not directly have anything to do with the cross-sell. Do you think the report was a whitewash? SENATOR ELIZABETH WARREN: So let me just do both halves. They pick one scandal and say, ‘Gee, we don't think he was directly implicated.’ I'm sorry, he was part of the management team. This was a massive fraud. So whether his participation was simply to cover up his ears, or cover up the evidence that he knew what was going on, either way, he should be pitched out. JIM CRAMER: Now, Janet Yellen, who was a terrific Fed chairwoman, had a long, long time to look at this, and she decided to sanction the bank. But she did not feel that Mr. Sloan should be fired. I wonder if you think that Janet Yellen and-- she was the regulator, and Jay Powell, current regulator, didn't do their job here. SENATOR ELIZABETH WARREN: --in their organizations. JIM CRAMER: Fair enough. Well, I have to tell you, Senator, you have also been in the news lately about billionaires. JIM CRAMER: ‘--and their buddies.’ Now, Howard Schultz created an institution that has given-- that's put food on the table for 300,000 people and offered a chance for baristas to go to college. Michael Bloomberg, I think you have to agree, has done more for higher education, in terms of trying to get people who are not wealthy into these schools. These are two paragons of Elizabeth Warren's view. SENATOR ELIZABETH WARREN: And that's great. But here's the deal: they made a bazillion dollars. And now the question is, do they have to pay a little portion of that to make sure that we're reinvesting so the next kid gets a chance, and the next kid gets a chance, and the next kid gets a chance? You know, that's basically how the system is supposed to operate. Not-- not just because sometimes gives as a matter of charity, but because that is your obligation. That's part of the social contract. That's part of being a citizen of the United States of America. When you make it big, when you get so much from this country, then you got to take a little piece of that and you've got to put it back in so that we can build a strong education system, Pre-K through college, for all of our kids. SENATOR ELIZABETH WARREN: So that we can build that infrastructure. JIM CRAMER: But how about those who have taken the pledge, so to speak, to give half their wealth? Should we just perhaps-- maybe you craft legislation that says that money should go to make it so more poor people can go to school? JIM CRAMER: Okay, so we want to go with Michael Bloomberg, again, a man I know you admire. He says, when asked about the wealth tax, ‘It's probably unconstitutional. And there's an example to avoid for anyone favoring radical redistribution,’ what is what he calls it, ‘it's called Venezuela.’ He almost sounds like that you are-- take-- making a war against so-called oligarchs in Russia. I know you're a capitalist. I know you're not declaring war against billionaires. How do we reconcile this? 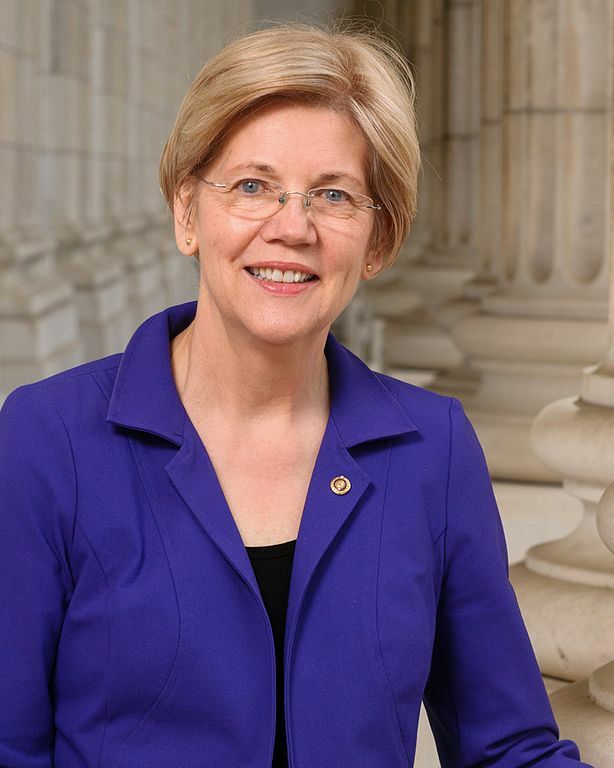 SENATOR ELIZABETH WARREN: Look, all I can say is we've watched Michael Bloomberg, we have watched billionaires stand up and say, ‘Look, I wanna run for president. And one of the first planks in my plan is going to be no new taxes for billionaires.’ Look, all I'm asking for is a little slice from the tippy, tippy top. A slice that would raise-- and this is the shocking part, Jim-- about $2.75 trillion over the next ten years. That's money we need so that every kid in this country has a decent childcare opportunity, has an opportunity for Pre-K, has an opportunity for a decent school. All we're asking is when you make it that big, put something back in. And we're asking for a little fairness in the system. You know that top one tenth of 1% this year, taxes all in, they're gonna pay about 3.2% of their total worth in taxes to help keep everything running around here. You know what the 99% is gonna pay this year? They're gonna pay about 7.2% of their wealth. That's more than twice as much. What I want is I want these billionaires to stop being freeloaders. I want them to pick up their fair share. That's how we make a system that works not just for the rich and the powerful but works for all of us. SENATOR ELIZABETH WARREN: Thank you, Jim. JIM CRAMER: “Mad Money” is back after the break.